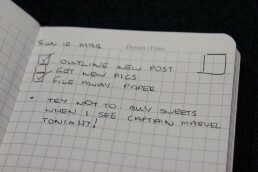 I never really do anything fancy on my pages, literally, I do include the usual day/date/time etc but I do like to add something so simple, so effective and forms the backbone of my overall productivity workflow. 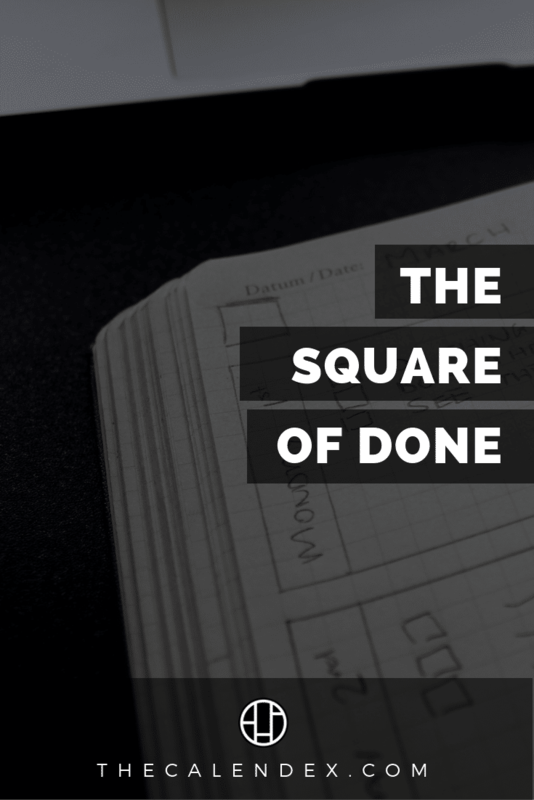 It still blows my mind and hopefully yours too… The Square of Done. I hear you. ‘The Square of Done? That sounds stupid’. And you’d be right… STUPID SIMPLE. I’m not even kidding. I did say it was stupid simple. I draw this square on every single new standard page before I begin taking notes. It lives either in the top left-hand corner of the left page or top right corner of the right-hand page. 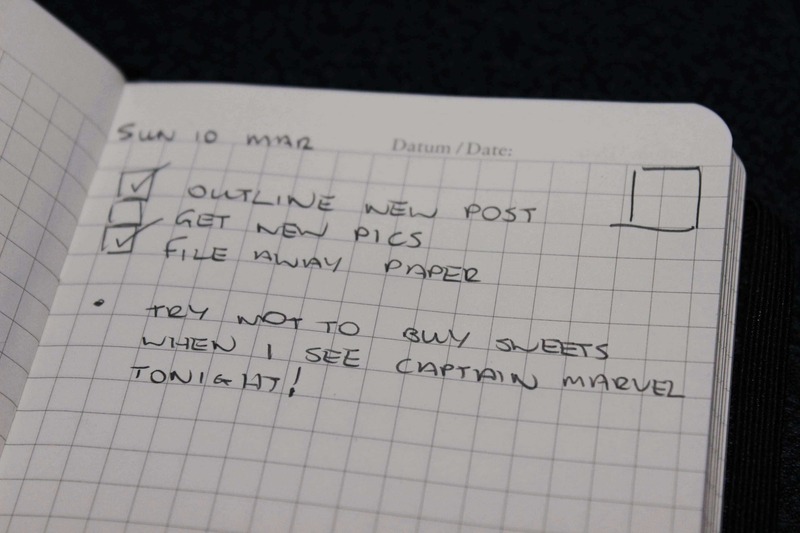 This is so it can be easily seen when flicking through the notebook. This is vital. 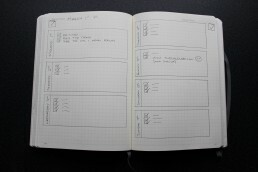 I have also written about my pocket notebook setup so you can see my minimal approach and how The Square of Done fits in. Side note: I choose to use a square for no other reason than that no matter how scrawled the lines may be, it will still be recognisable as a uniform square. My free-hand circles look like incomplete ovals which I don’t appreciate. So if you do end up giving this a try use any shape you like! Just imagine… The Circle of Done, The Hexagon of Done, The Heptagram of Done, The Quatrefoil of Done. You get the idea. The square, Master Square if you will, acts as an indicator which shows me if everything with a checkbox on the page has been ticked. If so, I put a big fat ‘Done’ tick in the ‘Master’ Square. So if it is empty it means there is something on that page that still needs to be done! This has proved to be extremely powerful because it means I don’t need to ‘migrate’, in this case, tasks. If I can avoid writing tasks down more than once then I will. Although if it is something really important then I will migrate it to my ‘Today’ page so it’s front and centre. I get that migrating can help as it can cement the task in the memory or allows for some sort of reflection or review process. But my review process is the physical act of flicking through my pages, checking of course for the Square of Done. It’s not as tedious as it sounds. 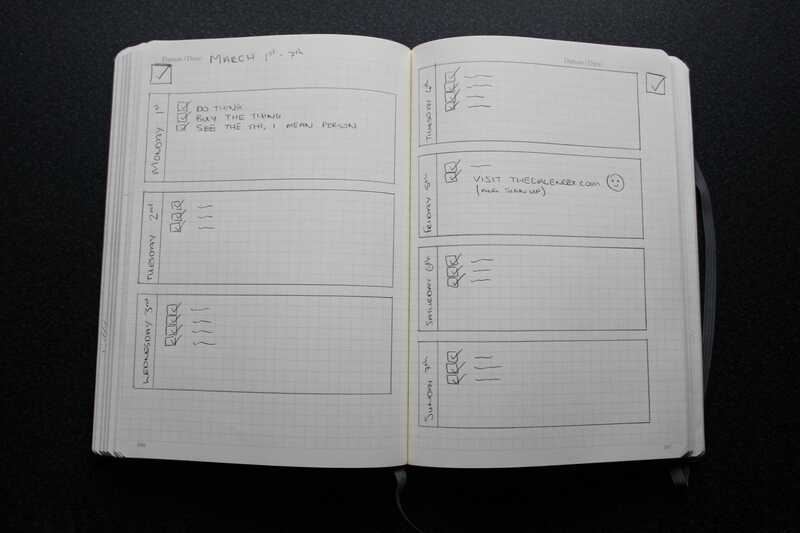 If you use your notebook every day you naturally flick through the pages anyway. Well, at least I do. And as I use it all the time I know what’s in there so no, no tasks slip through the cracks. Not at all but I wouldn’t start a new page without it. I obviously don’t include it on the Calendex page or the projects page even. Although there could be a compelling argument to add it to the projects page but for now I’ll leave it off. This may change in future notebooks. What if I use Weekly Spreads? This is a great excuse for you to get even more creative! There are tons of ways The Square of Done can be incorporated into your spread. 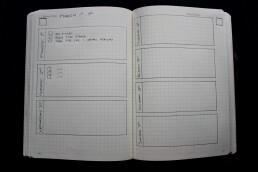 Below I have rustled up an example of a weekly spread and applied the Squares to both pages. I think the best practice is to just use one square to represent the whole week on the right-hand page but it’s up to you how you do it. Anyway, it is only partially filled in so you can see how it looks before the week’s tasks start punching you in the face. You could even add the square inside each ‘day of the week box’ but I think that is missing the point of how it works which is by flicking through pages and seeing at a glance. But by all means, give it a try and see if it works out. Next is what it would look like once it is all filled in. The Square of Done remains empty until everything has been ticked off. For the purpose of this demonstration, all the tasks have been completed on schedule (hooray) by the end of the week. Once you are sure all the week’s tasks have been done and ticked off you can go ahead and slap a nice big tick/smiley face/sticker whatever you like to show that the weeks tasks are done so you can begin planning for the upcoming week. If you wanted to be even more out there, you may not even want to use a square at all. Once the days or weeks tasks have been done you could add a sticker (if that’s your thing) to the top corner instead of a ticked box. Do it in whichever creative way you can think up! I tend not to get pressured to do tasks by a certain date (apart from paying bills) and don’t adhere to the sentiment that you must assign all tasks a due date. It can stress you out if you have a ton of tasks you haven’t done on certain days so why get stressed. The reason we love notebooks and writing things down is to bring calmness organisation and sanity to our everyday lives. But don’t be fooled, the mere act of writing something down won’t magically do the thing. You still have to do the thing! A lot of my tasks are part of projects of which have deadlines. Tasks corresponding to certain projects must be done before the deadline so depending on the nature of the project it makes no difference when the tasks are done as long as they get done by a certain time. A simple task like ‘cut the grass’ isn’t urgent. I can write it on my ‘today’ page but it might rain all day so it won’t get done, I could be out all day and by the time I get home it’s too late and I just don’t want to it right now. The world will not end if the grass is not cut by the end of the day or even tomorrow. Just do it when you get a chance. Don’t stress about it. And you certainly don’t need to migrate it because the Square of Done is empty for that day acting as a reminder.